For us the main and most impressive features of A Pobra do Caraminal were the port, park and beach vistas. The town itself is however quite attractive and has a main road which runs all the way through it from which the many other tributaries veer off. Below, a typical street shot of the town. A big drawback to the exploration of our visit was the time of day during which our outing took place, i.e. a three hour period in the afternoon. Whilst I am a strong supporter of cultural heritage, and that includes the Spanish siesta period, much of Galicia still has little concept of tourist support. This was emphasized by the closing of the tourist office (albeit on a Sunday) from 11.00am to 7.00pm. When you bear in mind that A Pobra do Cariminal is a two or three hour drive from all the main tourist centers (e.g. Santiago de Compostela or a town like Muros), you realize that the only times that this office would be open would be while you were incognito. It really makes you question the merit of some tourist offices opening at all and it is for this reason that our exploration of A Pobra was not quite what it might have been. Below, a statue, one of many. 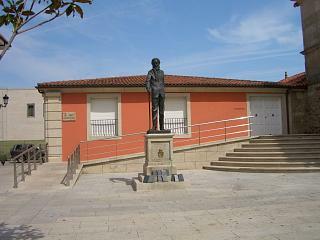 This particular statue was close to the museum in part of the old town. The first thing that we noticed about A Pobra do Caraminal was the cleanliness of the place. There was no litter and everything and everywhere appeared well looked after. As you leave the main park area it seemed that most of the interesting parts of A Pobra lay between the main road and the sea, but at the time of our visit shops, churches and the museum were closed. 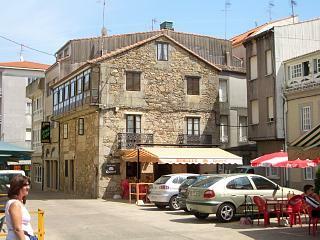 The original village of "A Pobra" was recognised as a "villa" in 1554 and by 1822 was merged with the neighbouring districts of "Pobra do Dean" to form the present day Pobra do Caraminal. The name "caraminal" is a reference to a plant that used to grow vigorously in the area and it is also emblazoned on the towns coat of arms. In terms of things to see, A Pobra do Caraminal has the usual churches, although none are of exceptional note. It does however have some other interesting buildings including those listed below. 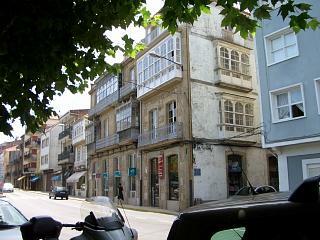 The photo to the right shows what we beleive to be the "Bermudez Tower" which is now a library and museum. Like the tourist office it was closed for the duration of our visit. The "Casa Grande de Aguiar" (big house or mansion of Aguiar), originally constructed in the 16th century and then significantly rebuilt again in the 18th century. The "Xunqueira tower", an old fortress dating back from medieval times. 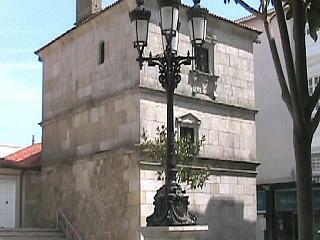 The "Bermudez Tower" which acts as a library, repository for artefacts and doubles as the "Valle-Inclan museum". A Roman bridge at "Miserela" that crosses the river "Pedras" and, as with many similar Roman and Celtic structures, is claimed to have a connection with the "per loca maritma" Roman road that passes the length of the "Barbanza sierra". Finally, a further two buildings, the "House of culture" and the "A Mercede masion". To the right, another of what we presumed to be one of the older buildings in A Pobra. The town did have several churches, but the proximity of other buildings made taking photographs difficult.